Patrick and Heath Holland get very, very small. Great episode. I agree that the movie needed to be funnier with jokes that landed better. I thought all of the stuff with Michael Peña was my favorite of the whole movie and found him very funny. I could have used a lot more of him. You're also spot on with the lack of personality. That's my biggest regret with Wright leaving the project is I think it would have been oozing with much more personality and energy if he had stayed on board. I do think I look forward to seeing these characters again with writers/directors who can hopefully bring out these qualities more in the material. This just misses the mark. If Edgar Wright had made it, Ant-Man would have been a better film. But Marvel doesn't make films. They make movies. In their minds, the movies have to now fit together into a coherent whole, set up by the template Favreau established with Iron Man. It reminds me of television. All the movies have to fit together under the umbrella that Marvel mastermind Kevin Feige agrees upon. There will be no 12th Monkey escaping from this pack--not as long as the studio continues to hire TV directors or others who have not had a film in cinemas for years. As film fans, it's discouraging. As a movie fan, it makes for a fun time at the mall theater. Someone said to me the other day, "I see Marvel as soda pop and DC as vodka and Red Bull". They may not be far off. Peyton Reed actually directed half of the animated BttF series. Didn't hold my interest throughout, I'd give it a 7. Haven't seen the movie yet, I only listened to the spoiler-free section. I'll eventually circle back, but I wanted to point out that Heath is voice twins with Grantland's Wesley Morris. This just struck me today and it is frightening. Voice twins, Alex, or ACTUAL TWINS? I actually really liked the movie a lot. I agree that it has a ton of problems. The biggest for me was Carey Stoll who I thought gave a poor performance for a garbage character. But the highs here for me were so high that I didn't really care. I thought it was very funny consistently. You may be right about Scott Lang as a character, but I'm such a HUGE Paul Rudd fan that I enjoyed him throughout. I actually thought the movie was fun and different. I'm so sick of world ending blockbusters with mass death and destruction (which seems to be a popular sentiment around here) so I watched Avengers 2 feeling like I had seen the whole movie before. I wasn't a fan. And here Ant Man comes with it's good natured personality, low stakes, and consistent fun. It was just what I wanted. I left the theater satisfied. Also, I had no problem with the end kiss. Sometimes a guy finds a girl cute and decides to go for it. It doesn't have to always be deep. I don't want anymore Thor style love stories. I enjoyed the Ant-man but I found it to be very Meh. I had a lot of the same issues Patrick had with the movie. I really like that they didn't take the obvious route with Bobby Cannavale's character. Pena made me chuckle a few times and im always happy when he shows up in a film. The Paul rudd heist scene was probably one of my favorite scenes in the movie. I like how they showed him to be a thinker and a problem solver. I had more or less the same reaction with Ant--Man. I had fun, I just can't help wondering what it would've been like if Edgar Wright hadn't left. So in a roundabout way, it was much better than it had any 'Wright' being. Until I read anything contrary, I'm going to wager a guess that the third act -- Ant-Man's fights with Yellowjacket, all of the shrunken Ant-Man stuff, and the stereoscopic special effect photography, especially in the subatomic, quantum realm that for me showed heavy influence of the Kubrick Stargate sequence in 2001 -- is all that's left of Edgar's input on the film. Edgar supervised the effects for three years before leaving. There's no way Marvel was going to ditch all that work. There's a subplot in the film that I am iffy about, and if I'm way off on how I took this, let me know. Now, when Scott returns the suit to the safe at Hank Pym's house, Hope calls the cops on him and has him arrested. Hank helps spring him from jail, and thus begins a rabid manhunt for Scott Lang. There is a point where Hope seems to let Scott off the hook for being Hank's choice to don a suit, especially when she learns how protective her father is of her. So why doesn't she ever call the cops back to drop the charges? These Marvel movies are beginning to feel a lot like a tv series with feature length episodes we need to go to the theater to see, with the end title tags (more often than not) being the coming attraction for the next episode, only instead of "Next week on Marvel's Agents of SHIELD," it's "Next year... from the MCU." That's not even what I would consider a gripe, because by and large, I'm very happy to go to the theater to watch a Marvel movie. I know I'll have fun. Damn you, Marvel. Take all my money. I'm very weary with Marvel Studios and how they treat their directors. They seem very particular with who they allow carte blanche to, and even that isn't an absolute and normally lasts for a single film. They gave a lot of leeway to Jon Favreau on Iron Man, only to pull the rug out from under him on Iron Man 2. Alan Taylor talks now about how he feels Thor: The Dark World was taken away from him during post -- not to mention Marvel sending Joss Whedon in during shooting to "fix" things for them. And of course, Alan Taylor wasn't Marvel's first choice to direct the film. Joss makes it seem like he had a nice enough time making The Avenger, but that the production of Age of Ultron, from every possible angle, was "soul-crushing." And then, of course, came Edgar's brush with the studio. I'm really scared that James Gunn is in for something hellish when he gets to principal photography on Guardians of the Galaxy Vol 2, and if the Russos don't die or commit hara-kiri before they get to The Avengers Infinity War Part 2, they may at least walk away with their lives, their sanity, and some decent films to be proud of. I guess it's been a couple of years ago now, but at some point I decided that Marvel movies are like modern day serials. They just unfold a couple of times a year instead of every week and they last a lot longer. The idea is the same: you have an adventure and then you set up a tease to bring people back for the next chapter. Of course, now that I'm saying this, I realize that this is exactly what comic books do. My lord, these movies are like trade paperbacks. Why don't they just number the spines of the DVDs? I'm digging that serial analogy. I've been hoping Marvel would continue making those short films they used to include as special features on video. What I really hoped they'd do is premiere the shorts Pixar style, before each movie. I wanted to like this film more than I ended up liking it. Like all the Marvel films, it's good and entertaining, but that's it. A serviceable film that get praised because it has a superhero. Everyone gives the film a pass because it exceeds expectations but is that really how we should judge a film? Am I the only one who really likes Back to the Future 2? I know it's not nearly as good as the first, but I always it was a lot of fun. I always liked how it didn't try to just do the first movie over again (despite literally reusing scenes from the first). The first is a comedy with some sci-fi elements, and the second is a sci-fi movie some some comedy elements. It's the only one that has fun with the time travel device to drive the plot, instead of using it as a plot device. That's why I don't care for part 3, it's kind of just a remake of the first in a different time setting. I really like Back to the Future Part II. I like them all, to be honest. I think Part III was my favorite sequel when it came out. I remember seeing it at least three times theatrically. I've found myself rewatching Part II more often lately, though. I agree with Patrick when he says it's the more experimental of the three films. One, because he's right. Two, because Zemeckis had said as much when discussing his reasons for making the movie. Aside from Who Framed Roger Rabbit, I think this was the beginning of Zemeckis's phase of making movies only to develop whatever new technology engaged his imagination. The outcome was that I think he lost the passion of making movies -- it all became technical exercises for him. Luckily for him when he made Back to the Future Part II, he had Back to the Future Part III as a chance to cut loose and have fun. Spielberg could learn a lot from Marvel and the way they were able to literally shrink Paul Rudd and the camera and photograph ants in their environment and doing tricks. Antony is a very talented ant. You can't make ants in a computer, Steven Spielberg! Very intrigued by the tease at the end of the podcast. Oh well, I'm off to play with my stick team. It's ironic that you guys start the podcast with talking about coming around to movies and not immediately "feeling" them - Maybe Patrick should watch this one a couple of more times in the future? I actually thought it was great, and what Patrick labels "conventional" I felt was classic. (To each his own, sure). Unlike most of the other Marvel movies this felt to me like a real movie; even, well-paced, with a sense of awe and a realization that there's a normal summer blockbuster audience out there to please (not just Marvel nerds). 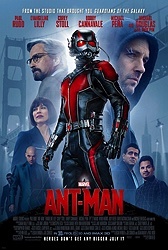 It's not just a generic good vs. evil-plotline and phony sentiments built around set-pieces (my main gripe even with Guardians of the Galaxy, which I think is enjoyable at times but it follows a mind-numbingly boring plotline and I think it's overall quite an overrated, loud and kinda fakey piece of retro-dazzle); Ant-Man dares to be that timeless action/adventure movie, the pre-Marvel comic book movie that just offers a good time, and it made me think of how happy I was coming out of the first Men in Black movie in 1997. So rare to see a movie that entertains you honestly, with its own content - just the plot, the characters and the wonder - without wanting you to be in on the joke, or trying to be cool, or wanting so bad to be so damn "awesome", or whatever. (Kind regards from Mr. Grouch). It's just a damn fine movie and I love how it doesn't feel the need to overdo it. I feel like this with a lot of Reed's movies, and I don't think this feels any more "commitee-designed" than any of the other Marvel movies. I love the old-fashioned family theme, I love how every character is both good and bad, I love how none of it is phoned in or ironic, I love the acting which is professional and earnest - the cast are just being pros, they get the characters, they do them like they should be done and then they get off the stage like a Meano Al Pacino would (Douglas is fine and Rudd is charming but Corey Stoll, Evangeline Lilly, Bobby Cannavale, they are so wonderful) - I love that I laughed really hard both at the jokes and the action scenes. As a reviewer, I watch hundreds of movies a year and I oftentimes feel jaded but here I couldn't help myself and it was so great just to be able to let loose (the bit with The Cure was probably when I totally lost it). I enjoyed the break from the 'meh'! Very well written sir. I can't agree on Corey Stoll, but I'm with you on everything else. Man, listening to the two of you talking about not having a good filter for old movies was like listening to myself talk. I've probably spent a lot more time in the oldies zone, reading the books and listening to radio shows from that era too, so I get more of the references of some movies; but still. One of the main things to remember of course is that often if a movie made it to DVD in anything but a budget title, it's probably at least decent. Someone wanted to see that movie, they put forth effort, there is probably some value. There are some real clunkers out there, but most of them are only on disc because they're public domain and as such cost nothing to produce. Anyway, I'm glad Heath is liking his journey through Film Noir. There's a lot of good stuff in there. Even when I do occasionally recognize that an old movie is bad (such as a 1950s low budget sci-fi or horror film), I still find things to like about it, and not in an ironic way. I just really, really love the way old movies are made. I love some modern movies too, but I think older movies are often a gold mine in terms of the way the actors presented their performances and the way the movies required that you invest and pay close attention, but reward you for your time. I get bored with a lot of movies now, but I never get bored with old movies. Seems like it should be the other way around. Anyway, I really am enjoying learning so much about film noir. It's more work than I ever thought it would be, and I really don't care much for the academic snootiness that seems to plague noir more than other types of classic movies, but the films themselves are usually stunning.